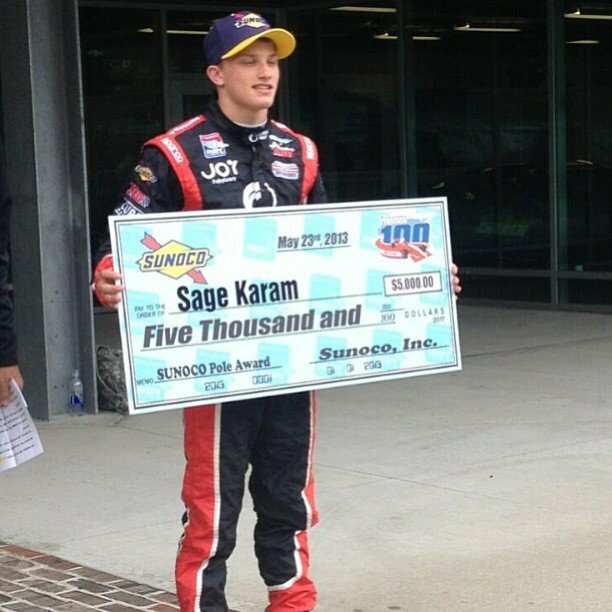 Still Karam was pleased to earn the Sunoco Pole Award for the Firestone Freedom 100 in his maiden Firestone Indy Lights oval race. The 18-year-old from Nazareth, Pa., posted a two-lap average speed of 189.243 mph (1 minute, 35.1160 seconds cumulative time). The Freedom 100 race will be broadcast live at noon (ET) on NBC Sports Network and on the IMS Radio Network on www.indycar.com. Karam, driving the No. 8 Comfort Revolutions car for Schmidt Peterson Motorsports with Curb-Agajanian, is in his first season in the series after placing third in the Pro Mazda Championship in 2012. He has a pair of podium finishes in the three races on road/street circuits. It’s the fifth earned pole and sixth pole start for Sam Schmidt Motorsports in the Firestone Freedom 100. Freedom 100 qualifications were delayed three hours because of a persistent light rain that cut short the morning session. The 11 drivers will face a green track when they line up. Series championship points leader Carlos Munoz, who recorded a two-lap average of 189.276 mph, will start second in the No. 26 Dialy-Ser Andretti Autosport car. He was .0703 of a second off Karam’s cumulative time over the five miles. Munoz also will start second in his maiden Indianapolis 500 Mile Race on May 26. Peter Dempsey (189.359) and Gabby Chaves (187.770) will share Row 2 in the Freedom 100. St. Petersburg race winner Jack Hawksworth (187.410) and Kyle O’Gara (187.393), making his Firestone Indy Lights debut, will be on Row 3.